There are two different ways to get price alerts in your MetaTrader Forex trading platform. The first one is to use the built-in Alerts system. The second way is to use the special Price Alert indicator. The former is much simpler and more customizable, while the latter allows setting visual price levels for the alerts. This tutorial will describe the the first way — the built-in Alert system. Both MT4 and MT5 support an alert system that allows setting the price alerts directly from within the platform. The MT4 version is slightly inferior due to lack of the Volume alerts and the alerts based on the Last price (such alerts don’t differentiate between Bid and Ask prices). All screenshots in this tutorial will be from MetaTrader 5 interface — the differences with MetaTrader 4 are minimal and aren’t related to the way the alerts are placed. 1. Switch to Alerts tab of the Toolbox window of the platform. If you have no current alerts set up, the tab will be empty. 2. Right-click inside the tab to summon the tooltip menu and choose Create, or press Insert button to create a new alert. 3. Alert Editor will pop up. 4. Enable checkbox can be unchecked to disable the alert temporarily without deleting it. 5. Choose Action to be triggered by the alert. There are 3 choices available: Sound (default) — will play a sound file of your choice, File — will execute a program of your choice, Mail — will send an e-mail message to the address set via Tools->Options->Email. 6. Now you can choose Symbol for the alert, Condition and Value. There are 9 conditions available: Bid >, Bid, Ask < — are self-explanatory; Last > and Last < — react on the last quote received by the platform disregarding its Bid/Ask type; Volume > and Volume < — reacts on the traded volume for the given Symbol; Time = — reacts on the local time. Value is either the price (for the first 6 conditions), a volume or a time in HH:MM format. The shown example sets a sound alert if EUR/USD bid price goes below 1.3800. 8. Set Timeout for your alert — the period of time to wait before alert action iterations will be performed. For example, if you set it to 10 seconds, you will hear the alert sound every 10 seconds. 9. Set the Maximum iterations number — this value determines how many times the alert action will be performed. For example, if you set it to 3, you will hear the alert sound only 3 times. 10. You can test the alert before saving it. Clicking the Test button will trigger your chosen alert action. 11. To save your alert, just click the OK button. 12. The created alert will be displayed in the Alert tab. Untriggered alerts are displayed in normal font (2nd and 4th in the list on the picture); triggered alerts are displayed in bold (1st and 3rd in the example list). Triggered alert with a crossed bell icon (1st in the list) has reached the limit of its iterations and will no longer work. Triggered alert with a swinging bell icon (3rd in the list) has one or more iterations left and will continue to work. If you want several actions to be performed on one event, you’ll have to set up several alerts with the same condition but different actions. For example, if you want a sound played and an e-mail message sent when EUR/USD goes above 1.6000, you’ll need to create two alerts, one will have Sound action and another — Mail. You may use alerts with many iterations to create your own e-mail informers. For example, you can create an alert with Mail action that will send you the latest Bid and Ask price on a given currency pair every 15 minutes. You have to use Bid and Ask macros in the mail body and set the Timeout of this alert to 15 minutes. If you liked the tutorial or if you don’t understand a part of it and still have some questions about using the price alerts in MetaTrader platform, feel free to leave your replies and ask your questions via the commentary form below. Every symbol should be explain in plain language and not be assume it is understood.This relates to: Bid , ask . With examples. Sorry, but explaining the basics, such as what Bid or Ask is, is beyond the scope of this tutorial. It is about price alerts in MetaTrader and supposes that you have some basic understanding of online Forex trading and operating withing MetaTrader platform. The explanations for the basic symbols (Bid, Ask, etc.) can be found in a Forex glossary. 1. In ipad platform, how to set price alert. 2. if set price alert via notebook, could i get notification via ipad? 1. I am not sure that iPad version of MetaTrader offers such alerts. 2. If you choose Mail alerts, you could receive via any other device. Is there a tutorial for setting alarms that can be sms’d or emailed? Thanks. Just select “Mail” instead of “Sound” in Action field to receive emails as alarms. You cannot set up SMS notifications without coding some handlers for that (e.g. redirecting email to SMS), but you can choose “Notifications” in Action field and you will be alarmed via MetaTrader mobile application on your phone (Android or iOS). PS: For emails, you will also have to set up your mailbox parameters in Tools->Options->Email. For push notifications, you will also have to enable them via Tools->Options->Notifications. Tried this earlier today to set alerts for volume after finding this information and changing from MT4 to MT5 in order to set alerts by volume. Problem was the alarm kept going off. For example set an alert for USDCHF volume> 800 and as soon as click Ok, the alert goes off even if the volume in the current period (set to M5 and timeout to 5 minutes) was below the alert limit. What have I set incorrectly? Does the alert work if the condition has been met in the last day as opposed to every new time the condition is met? The Volume in Alerts is not a tick volume. It is a volume of the last executed trade, which applies only to stocks. It cannot be used with USD/CHF. hi i use mt4 arrows to see the direction where will go the price but it is not work properly , if i do it every time when it show me then i loose 70 % of my money, what i need to do? What is “MT4 arrows”? Is it related to price alerts? is posible to see where go the price for next minute? Default alerts settings are stored in \config\terminal.ini. To change the default number of iterations from 5 to 10, you need to find the line ‘AlertEditorLimit=5’ and change it to ‘AlertEditorLimit=10’. If there is no such line, just add it. As for turning expiration box off by default, look at other parameters that start with ‘Alert’ because I do not know how it is called exactly. Then just remove the line that starts with ‘Alert’ and looks like to be dealing with expiration. Hope this helps. If you find the expiration parameter, please let us know how it is called in the terminal.ini file, so other visitors could find it more easily. Thanks! 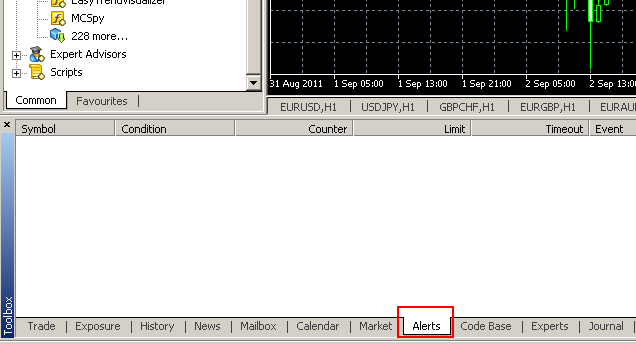 Unfortunately, the alerts in MT4 and MT5 are platform-based and do not save into profiles. This means that there is no straightforward feature to transfer alerts from one PC to another. In MT4, got to the platform’s data folder, then to profiles subfolder. Copy alerts.ini file and paste it in the profiles subfolder on your other computer. In MT5, got to the platform’s data folder, then to bases subfolder. Copy alerts.dat file and paste it in the bases subfolder on your other computer. That’s it. Please let me know if it works for you.